Heat oven to 400°F. Spray 2-quart casserole with cooking spray. In Dutch oven or 3-quart saucepan, cook and drain pasta as directed on package, using minimum cook time; return to Dutch oven. Meanwhile, in large skillet, cook beef and onion over medium-high heat 5 to 7 minutes, stirring occasionally, until onion is tender and beef is thoroughly cooked. Sprinkle with 1/4 teaspoon of the salt and the pepper. Remove from heat; stir in ketchup and Worcestershire sauce. Cover to keep warm. In 2-quart saucepan, melt butter over medium heat. Stir in flour with whisk. Gradually add milk. Heat to simmering; cook 2 minutes, stirring constantly. Remove from heat; stir in Cheddar cheese and remaining 1/4 teaspoon salt. Pour cheese sauce over pasta in Dutch oven; stir to coat. Spoon pasta mixture into casserole. Top with beef mixture; sprinkle with bacon. 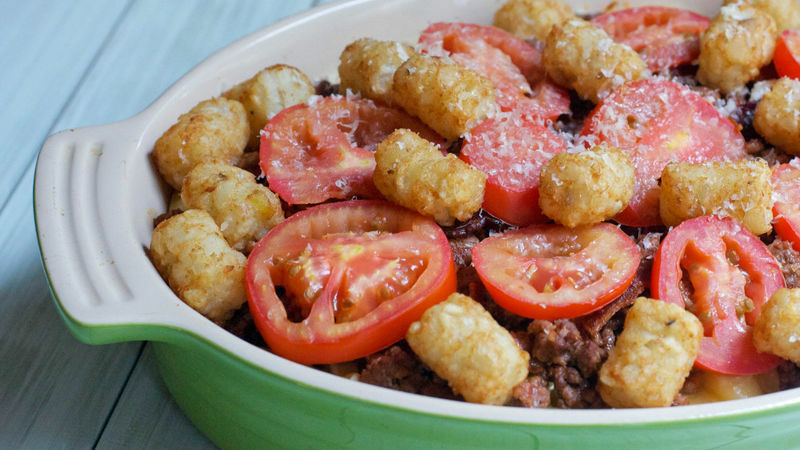 Arrange tomatoes and potato nuggets on top. Bake uncovered 15 minutes or until potatoes are crisp. Sprinkle with Parmesan cheese. Save time by using your favorite boxed macaroni and cheese instead of cooking the pasta and making the homemade cheese sauce. Substitute ground turkey for the beef and use whole wheat pasta to “healthify” this dish.